Although kids are sure to enjoy the colorful caper, this unapologetic love letter to The Muppets penned by one of their biggest fans (Jason Segel) taps into the nostalgia 30- to 50-somethings have for a show that was leap years ahead of its time. Although kids are sure to enjoy the colorful caper, it taps into the nostalgia 30- to 50-somethings have for a show that was leap years ahead of its time. We left our day jobs a little early yesterday to catch The Muppets, that’s how excited we were to see Jim Henson’s legacy back on the big screen. Since Kermit and his buddies have been absent from pop culture attention for a little over a decade (we don’t care what anyone says, Muppets from Space was a great Gonzo ride), we were eager for a fix. We’re happy to report, the bright production didn’t disappoint. The sinister Tex Richman (Chris Cooper) finds a loophole in Kermit’s “rich and famous” contract that will allow him to take the crew’s character names and their Los Angeles Muppet Theater, which has fallen into disrepair since Miss Piggy and the gang disbanded years ago, if they don’t pay him ten million dollars. Walter (Peter Linz), a felt, Muppet-esque guy that idolizes frog and friends, overhears Richman’s dastardly plan and gets his very human and devoted brother, Gary (Jason Segal) and his brother’s girlfriend, Mary (Amy Adams) to warn Kermit. As the story unravels, each player is asked to decide who they are (man or Muppet, lover or friend, plumbing mogul or performer) and what’s most important. The rest of the film is a “let’s get the gang together, put on a show and save the day” story reminiscent of a Judy Garland and Mickey Rooney vehicle and, as a nod, Rooney makes a cameo at the very beginning of the movie. 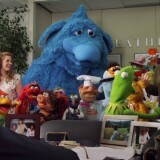 In fact, in true Muppet tradition, there is a star-studded array of well-known faces that join in the fun including Alan Arkin, Jack Black, Zach Galifianakis, Ed Parsons, Donald Glover, Kristen Schal, Ken Jeong, John Krasinski and James Carville, among others. The movie is an unapologetic love letter to The Muppets penned by one of their biggest fans, Jason Segel. Throughout the film he examines their importance to our collective psyche and invites us to revel in their offbeat humor and simple, straightforward earnestness. We loved the catchy tunes contributed by Bret McKenzie, half of Flight of the Conchords, who starred in their own joyful and eccentric small ensemble comedy that was not unlike The Muppet Show in many ways. Although kids are sure to enjoy the colorful caper, it taps into the nostalgia 30- to 50-somethings have for a show that was leap years ahead of its time. And I think we all hope the lights stay lit at The Muppet Theater for years to come. Drinking Buddies: So hoppy together?